Extra precise shooting requires an exact knowing of distance. Integrated laser rangefinder with range up to 400 m allows to measure distance in single measuring mode and in scanning mode with precision up to ±1 meter (yard). In the conditions of changeable landscape, when shooting from high stands it is recommended to use THD (True Horizontal Distance) measuring mode – in this mode rangefinder, taking into account angle of shooter’s elevation relative to a target (AoE; its value is also displayed on the screen) calculates true horizontal distance to an object. A reticle is electronically displayed on the screen and is permanently located in the plane of target image. The Digisight LRF’s internal memory contains 13th reticles of various shapes and applications. The central part of the reticles is illuminated; color can be changed from red to green. The color of the main part can be switched from black to white. The Digisight riflescopes feature a 67 mm eye relief – one of the best parameters in its class. The greater is the eye relief the less traumatic is the use of the scope, especially on hunting weapons with considerable recoil. The software allows the user to save in riflescope’s memory three points of impact for three various distances (types of weapon or cartridges), and each option allows the use of a dedicated reticle. The horizontal and vertical numeric coordinates of the reticle position facilitates windage/elevation adjustments and completes memorization function. The Digisight LRF riflescopes feature high shock resistance and can be used with rifled hunting weapon for such cartridges as 9.3х64, .30-06, .300, .375. etc, and with smooth-bore and airsoft weapon. Magnification provided by optic and software parts of Digisight LRF, makes up 4.5-9x. Magnification changes gradually – available magnification range consists of 10 steps (division value is less than 0,5x). Zoom value is displayed in the status bar in the bottom part of the screen. When a weapon with a riflescope is in inclined position of 70° vertically and 30° horizontally (for more than 10 seconds) in any direction the riflescope will turn off. 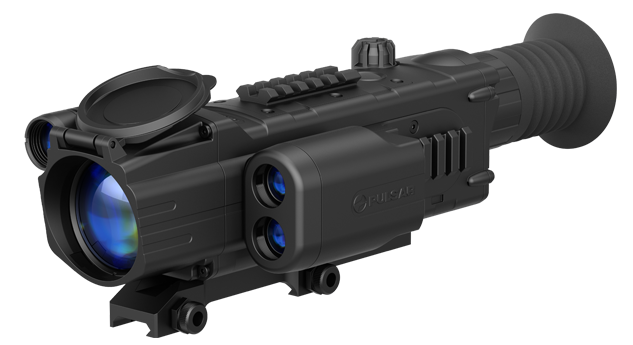 For energy saving and cases when video from the riflescope is not recorded there is also a possibility to turn off video out module. Both these functions can be activated in the menu of the riflescope. When rifle is inclined horizontally for an angle of more than 5 degrees a warning sign appears – compound arrows with indication of direction and incline level. The more lines are in the compound arrow the greater is the angle of side incline. Standard for Digisight riflescopes “one shot zeroing” in Digisight LRF models is complemented by an even more convenient zeroing function - “Freeze”. Now after making a zeroing shot it is enough to save a frame of a target in the memory of the riflescope and align reticle with point of impact looking at this frame without the necessity of keeping full immobility of a weapon. Depending on modification Digisight LRF riflescopes provide more than a half kilometer detection distance for object 1.7х0.5 м. in size. The Digisight LRF riflescopes are equipped with a Video Out jack enabling real time video recording with the use of external recording equipment. Operating time can be significantly prolonged thanks to the use of high-capacity external power supply units attached to the Digisight via an External Power jack. During extended use in freezing weather, the external power supply units can be stored under the operator’s clothes via an included extension lead.